Rawe Rawe Homestay lies on the northern tip of Batanta’s Yarweser Island. 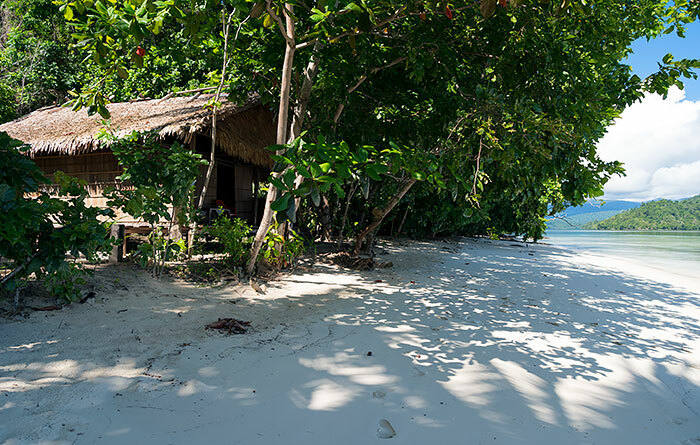 A single two-room bungalow with in indoor bathroom sits just off the beach in the shade of the lush beachside jungle. Each room sleeps two on a mattress on the floor, and sheets, pillows, bolsters and mosquito nets are supplied. 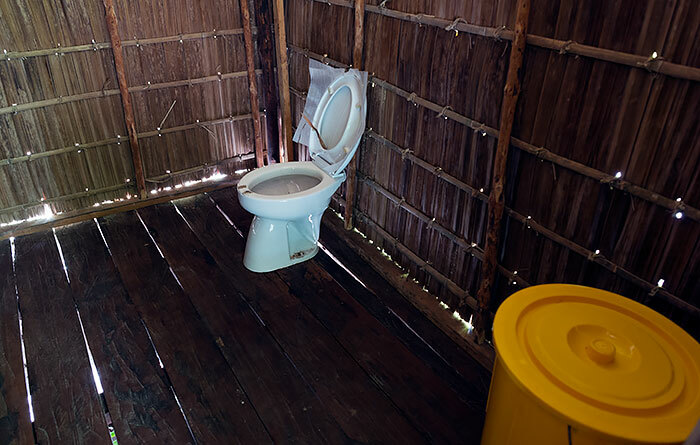 The two bedrooms open onto a common area that can be used for storage, and a western style toilet and bucket bathing is provided in a room at the back of the common area. Meals are served at a table on the bungalow verandah and plenty of plastic chairs are available. Free drinking water and tea and coffee making supplies are provided there for guests. Electricity is provided by generator and is available from sunset until midnight. There’s no phone signal at Yarweser, so you’ll be completely offline at Rawe Rawe Homestay. You’ll need to bring all the consumeables you consider essential for your stay, as Rawe Rawe Homestay is splendidly remote and only basic supplies can be purchased in local villages. Arefi is about a twenty minute boat ride away. 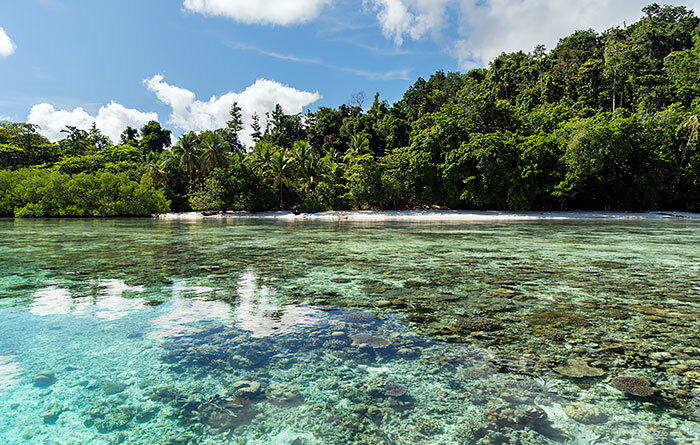 Raja Ampat suffers from a total lack of safe waste disposal and recycling services. All homestays request that their guests please take their inorganic waste away with them when they leave, so as to not contribute to the growing trash problem in the islands. English is spoken by the person with the contact phone below, but is not spoken at Rawe Rawe Homestay itself, so it’s best to have a phrasebook with you if you don’t speak Bahasa Indonesia. Transfers between Waisai and Rawe Rawe Homestay cost IDR 2,000,000 each way. The speedboat used can carry up to six passengers, and trip cost is shared. A long boat capable of carrying 4 people can also be used for Waisai transfers if you want to save some money. Longboat transfer price is IDR 1,500,000. NOTE: Waisai pickups by speedboat are the default as they are faster and more comfortable. If you want Rawe Rawe to use the longboat to pick you up from Waisai, then you will have to contact them to arrange it! 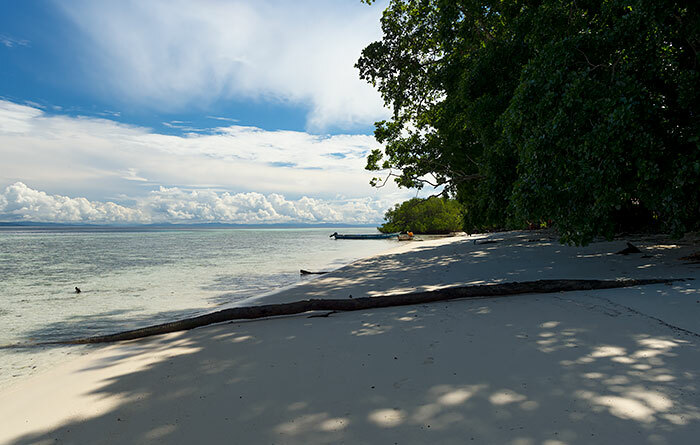 Transfers can also be arranged direct from or to Sorong if desired. The cost for those is IDR 3,000,000 (speedboat, 6 pax max). Again – if you want to be picked up from Sorong, you will have to contact Rawe Rawe directly to arrange it. 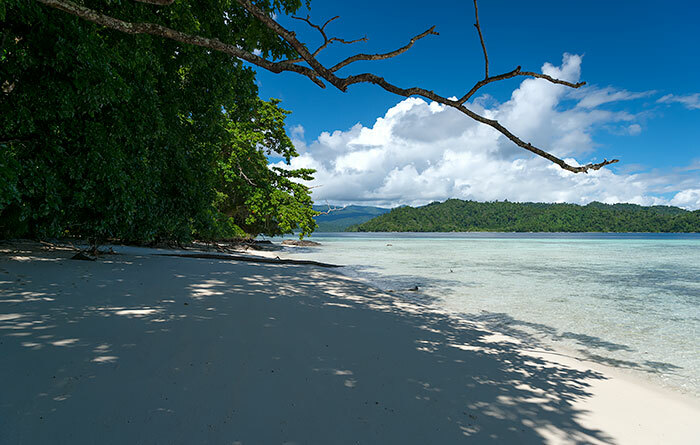 Bring snorkelling gear, because there’s plenty to see straight off Rawe Rawe Homestay’s beach. Black tip reef sharks cruise the shallows and kalabia (walking sharks) inhabit the shallows around the mangroves next to the homestay. All manner of juvenile fish can be seen over the seagrass beds and dugongs sometimes graze there as well. 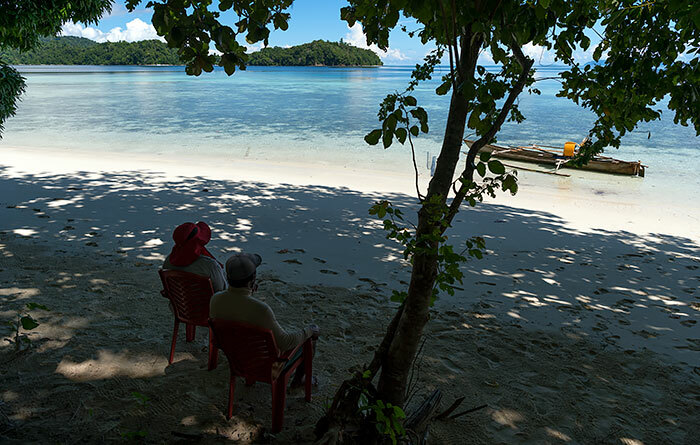 Pulau Dokri is a short boat ride away and offers fabulous snorkelling over rich corals. Just a few of the many other options are listed in the table below. Prices are per trip, shared by boat passengers. 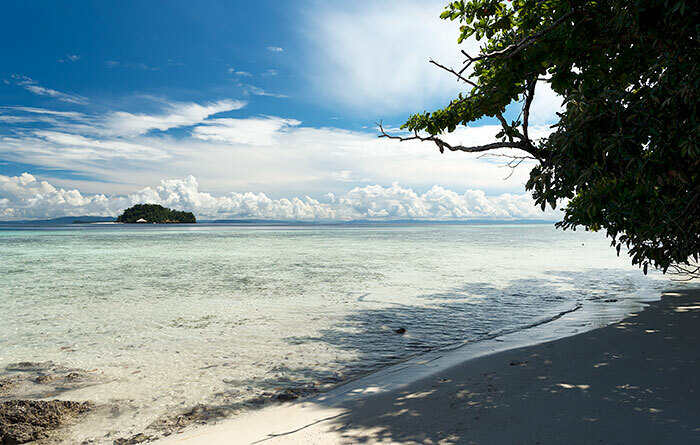 Rawe Rawe Homestay can organise an English speaking snorkelling guide if desired. Pak Amos can also guide divers, but divers will need to bring all their own equipment. 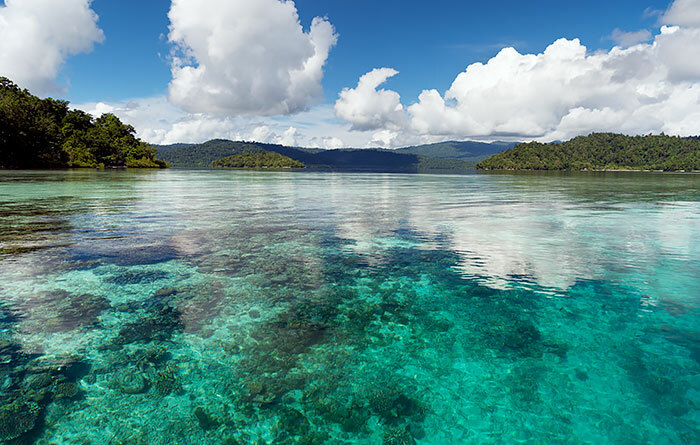 Be sure to read this important safety information before committing to dive in Raja Ampat. Rawe Rawe Homestay trips to see the Batanta waterfall cost IDR 600,000 (shared cost). I would like to echo the last comment from Manuela (we travelled together). I booked 2 bungalows (one for each of us). The booking was confirmed by a phone call a week beforehand and again 2 days before arrival. So I wasn’t amused to be told hours beforehand that the bungalows were not available due to other people staying longer than anticipated. We were then bumped off to another homestay which looked still in the process of being finished. There was no door on my bungalow, the roof leaked and the food was beyond basic (rice and canned sardines anyone??!!). Unfortunately this wasn’t the only place where double booking or other guests staying longer than booked, resulted in bookings not being honoured. This might be fine in a big city where there are plenty of hotels to go to but in remote areas this leaves people without accommodation and is unacceptable. I can not give a judgment on the homestay because, despite having booked 3 nights 2 months before, my bungalow was not available. The owner’s behavior was really unqualified. He left me and my friends in a unpleasant situation: hijacked on another homestay (which I do not name) from which we escaped after one night. Very poor food and rests inside the bungalow. We spent 4 days at Rawe-Rawe in February 2019. Since our last stay we enjoyed there (in november 2017), things have even improved: We now had a new private bungalow with attached mandi. The bungalow is well designed, good equipment and furnishing, the mandi very spacious and clean. Food very tasty, plentiful and varied. Don´t miss the mangos from Arefi (season in January-February): big, sweet and absolutely aromatic, the best mangos I ever had in my life..
To the webmaster/admin: Regrettably the description of Rawe-Rawe is currently not up-to-date (see review above). Is there a way for the homestays to update the infos and pics published on the website? And if so, do they know how it works? For sure latest pics of the new bungalow with the private mandi, would help to attract more guests. We stayed for four nights at the beginning of October 2018. We had a fantastic time and did some wonderful snorkelling. We were the only guests at Rawe Rawe and stayed in one of the two bungalows. The area, beach and bungalow were very clean consisting of two double rooms and a simple bathroom. Amos’s Mother and sister gave us very nice food. The fresh fish was delicious! For breakfast we had pancakes with an Indonesian black coffee and mid-afternoon fried bananas or chocolate cake! At 6:30am we were snorkelling from Rawe Rawe beach to one of the best points in the area: the site where the 2 drops meet at almost 90 degrees just to the left of the homestay. Every day after breakfast, we went by boat to 2 different snorkelling sites recommended by Amos who spoke pretty good English . One day we went to the Batanta waterfalls: very good and refreshing ! 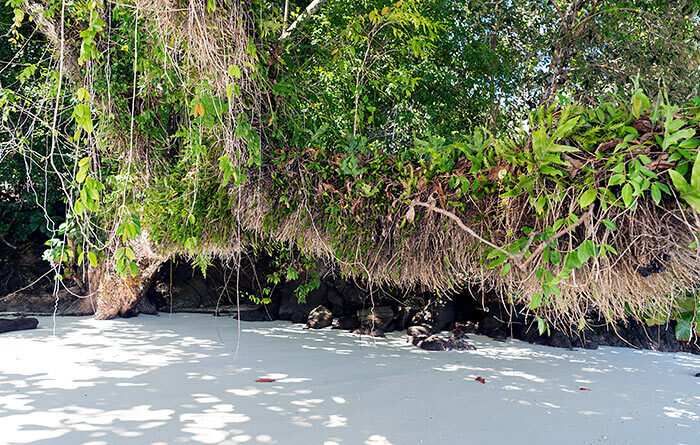 The sand islands are beautiful on the ocean and the corals and fish varies from site to site. We did not encounter any issue with the price of each excursion. To the contrary, the website is very clear. We would recommend you to print out the Rawe Rawe site in order to help with the planning and discussions. Many thanks to Amos and the whole family for wonderful hospitality and truly a place we would call paradise! Amos really went out of his way to ensure we had a memorable time !!!! INJOH, INJOH, INJOH !! Great place with wonderful location and service, great hosts and service with very good level of English. We were staying at Rawe Rawe for 5 days in March 2018, and it was a wonderful time. We were travelling as a familiy to R4 and it was the third time. Allthough we made so many great experiences in R4, Rawe Rawe was exceptional. Read the review above of Jonathan an Johanna – they hit it! The place is beautiful, the bungalow very well kept and – above all – Amos, Theo and the kitchen staff a great crew. Amos always came along when we were snorkeling and showed us everything… The food was great and every night we were “bercacap-cacap” on the veranda and training our bahasa… If you choose to go to Rawe Rawe straight from Sorong not via Waisai keep in mind, that there is no possibility to get the permit in Sorong any more. (Same problem with misool…) We also only can recommend to visit Rawe Rawe, you won´t be disappointed! Thank you Amos, Theo and the ladys…. My husband and I stayed at Rawe Rawe for four nights in late February of 2018 which many Indonesians said was a perfect time to visit and we can’t disagree! We picked Rawe homestay in part because I was hoping to return to my childhood. 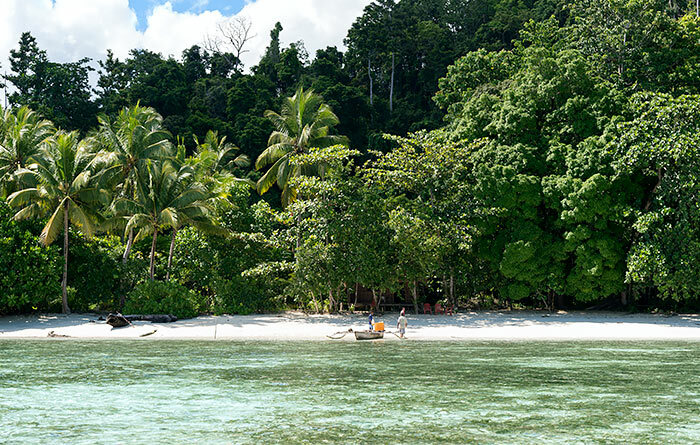 Growing up, my family lived for several years in Papua and a few times a year, we would go to a remote beach and camp. I still wake up dreaming of those indescribably perfect days and crystal clear, star filled nights and so when we began planning our Raja Ampat trip, my priority was to try to find that memory in the now. After reading countless homestay reviews and blogs, I settled on two locations – one on Friwen for the proximity to the Friwen Wall (which does have the best soft coral we saw in Raja Ampat) and the other on Batanta in hopes of recapturing my childhood. Narrowing down the Batanta options was somewhat challenging but we settled on Rawe Rawe and arrived on the beach in Batanta at sunset under the brilliant arch of a rainbow. Stepping off the boat, I was transported. The smells, the sounds, everything brought me back in time twenty five years. It was perfect. Looking back on all of our Raja Ampat adventures, Rawe Rawe and our time there remains, to me, the most precious. We were the only guests and so had the beach, the reef and the time of the very attentive hosts all to ourselves. They kept us well fed, we slept comfortably and the weather couldn’t have been more perfect! Day after day we would see storm clouds on the horizon, hovering over other islands, but on the north side of Batanta, all we experienced was sunshine, soft sea breezes and blue skies. We had read that the food in Raja Ampat was a frequent disappointment for travelers but we were exceedingly pleased with what we were served. We were given breakfast, lunch, dinner and an afternoon snack every day. My husband is a big eater but there was always food left over. Breakfast usually consisted of some variety of lightly sweetened bread (fresh donuts or cake) or friend bananas. Lunch was generally fresh caught fish, some variety of greens and noodles or rice with the occasional addition of eggplant. Dinner was very similar to lunch. All in all, the freshness and flavor were exceptional. It is true that the main staples of Raja Ampat food are very similar across the homestays, but the seasoning, preparation and quantity at Rawe Rawe made it stand out for us. The house reef has had some boat damage but the hosts were able to direct us easily to undamaged portions and those were just as I remembered – colorful, vibrant and teeming with fish. We took one offsite snorkeling trip to Urun Island, a trip we would gladly have done multiple times over if time had allowed. 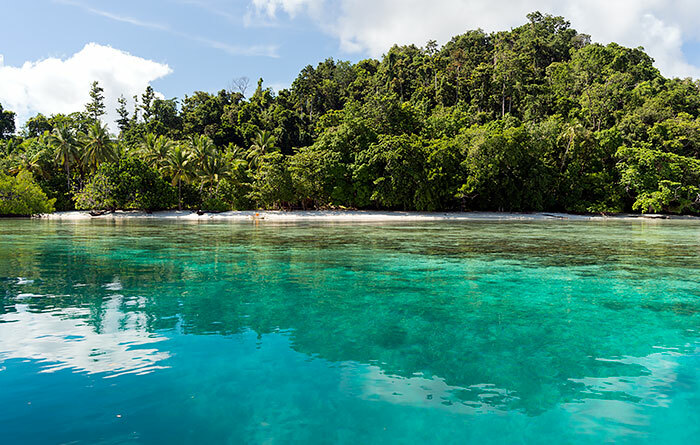 It remains one of our favorite snorkeling spots from our entire time at Raja Ampat. The reef is pristine and fans out in all directions from what is essentially a small sand atoll rising out of the endless blue. In addition to the countless varieties of tropical fish and coral, Urun Island is also the only place in Raja Ampat that we saw black tips while snorkeling though there were baby black tips in the water just off the beach at Rawe Rawe in the mornings. While at Rawe Rawe, we also took a trip to Batanta Waterfall. There are in fact two waterfalls; one is quite easy to reach and is a good bit smaller than the one in most of the pictures online, but absolutely charming in its own way. The other is quite a respectable climb away. Reaching it involves clambering up smaller waterfalls, up (and then down) boulders and river beds and along steep hillsides. But it is most definitely worth it if you’re able to make the climb! Even if that sounds a bit too daunting, definitely still make the trip to the lower waterfall which will involve winding through mangrove swamps, a short walk through the jungle and then a breathtaking view of the smaller waterfall while butterflies dip and swirl around you! Overall, the Rawe Rawe experience could have been six stars – not just five. They did everything in their power to ensure we were having the time of our lives and they succeeded. From meeting us in Sorong and helping us navigate the entire process from the airport to the Rawe Rawe beach, to helping me find butterflies on our waterfall trip, to offering to track down “obat” (medicine) for us when we were sunburned (which fortunately we had with us), they were exceptional hosts! If you’re looking for remote beauty and five star hospitality, Rawe Rawe is the place for you! A few things to note about Rawe Rawe as well as Raja Ampat in general. 1). Respect the sun. My husband and I had gotten rather burned during a trip to Belize and so thought we were being very careful. Unfortunately, the equatorial sun was more than our substantial (and reef friendly) sunscreen could handle. Many blogs recommend rash guards and they were right! In the end, since we both only had rash guards for our upper body, we had to try to convert other clothing into sun-shields. (Note: Yoga pants work really well as a rash guard alternative). Learn from us and make sure to bring full sleeve and ankle length rash guards as well as wide brimmed hats. 2). Neither of the homestays we visited provided towels. We had noted that fact in other reviews so we brought microfiber towels which we were also able to use as blankets on the plane. If you want towels, bring you own! 3). Bartering is a way of life in Papua. 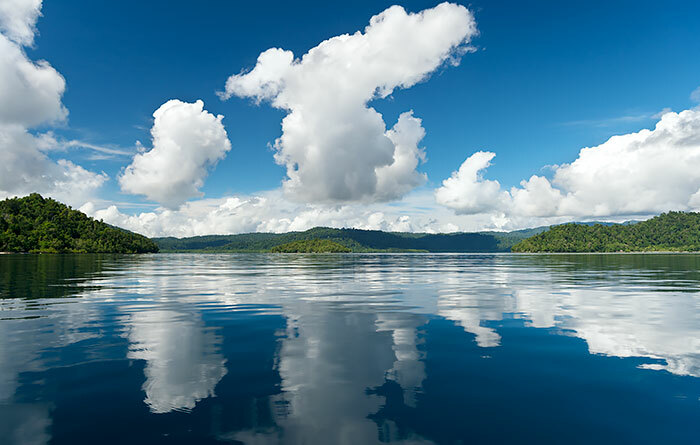 In preparing for the trip we noticed that the Stay Raja Ampat website had quite a few traveler reviews indicating that the prices charged onsite seemed to vary from what was listed online. We also found that to be the case. It was also clear that Western guests from cultures where bartering is not common often felt the price discrepancy was the hosts trying to “rip them off” since typically they didn’t discover the difference until check-out. At Rawe Rawe we didn’t find the difference significant enough to cause an issue and since we were exceedingly happy with our overall experience we were willing to pay the additional cost, but for other travelers who perhaps have a longer stay or tighter budget, making sure that all parties have agreed upon prices up front is key. Language barriers can make that more challenging but, as the Stay Raja Ampat website suggests, a phrase book can make an enormous difference. If you feel a price is too steep, say so. By the time we had acclimated to “bartering” we were at our second homestay and we were easily able to negotiate prices upfront that were both considerably lower than what was initially quoted and also provided the hosts with a nice profit margin. To summarize: ask for the cost up front if it’s not pre-disclosed. If you feel it’s high or more than you budgeted, be polite and let them know. Our experience indicates they expect a little bartering and don’t take a little push back personally so long as it’s done with courtesy and a smile. 4). The Rawe Rawe experience is brilliant in part because it is so very remote. That also means you’ll encounter all kinds of critters. You are essentially camping in style on a beach. We saw spiders, lizards, and even one rat. None of these bothered us while sleeping. None got into our belongings. But you’ll likely see and/or hear them. 5). There isn’t phone reception at Rawe Rawe, or in most of Raja Ampat for that matter, but ensuring you have some way to communicate while in Raja Ampat is something we wished several times we had. We were able to communicate with Theo by e-mail to arrange our pickup but arranging the handoff to our next homestay was a little more challenging. Theo and Amos obligingly made a few phone calls for us on their phones when we reached Waisai, but I would have been far more comfortable if we could have had text and or phone capabilities. 6). Both Theo and Amos speak some English. Between their English, the (very) few words I remembered from my childhood and the Bahasa Indonesia phrasebook, we never found the language barrier to be an issue – with the humorous exception of trying to explain our sunburns! (It became very apparent the Indonesian phrase listed for “sunburn” was not one commonly used.) Keep in mind, English is at least a third language for most people in Raja Ampat since Indonesian is likely their second. When we’d mastered a couple Indonesian phrases, Theo and Amos were even kind enough to teach us a few basic words in their own first language! To summarize: bring a phrasebook and don’t let the language barrier stop you! Good place and very nice people. Best food in Raja ampat. Fresh fish 2 times a day. Cooked in delicious way. Please bring your own towel, mosquito repellent and be ready to “shower” in mandi only. Good house reef for schnorchel and easy way to get into the water. We will come back definitely but we would like to see less rubbish next time. I only can confirm what Lothar says. It is a very good place. If they would provide towels it would be perfect. I was here in the beginning of december. It seems the season for jellyfish. Not only in Birie. I saw them already in Kri. But there were every day more. Because of that the snorkeling was not nice. But they say in january it will be fine again. We spent 8 days at Rawe Rawe in november 2017. Contact to Theo in advance was very easy and reliable via whatsapp. They awaited us at Sorong airport and brought us to the hotel. Next day they picked us up at the hotel, took us to the harbour and then by comfortable roofed boat to Rawe Rawe. 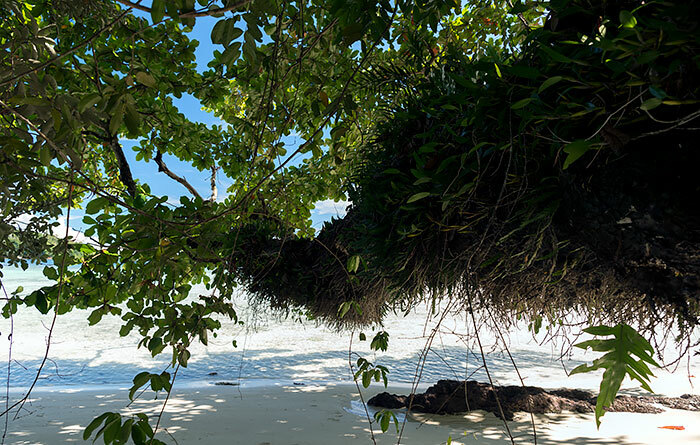 It´s a remote place, jungle with big old trees (and a variety of birdlife) stretches to the flat sandy beach. The 2-room bungalow right on the beach is spacious and well equipped, the clean mandi / toilette is attached. If you are not the only guests (which is not to be expected until now), there might be a lack of privacy though, but they already started to build another (privat) bungalow. Food was sensationel, always rice and noodles plus fish and vegetables. Best catering we ever had in Raja Ampat: varied, tasty, and much more than we could eat. Snorkelling off the beach is very good, there is healthy coral all along the beach, to the north as well as to the south. The family always took so much care of us so that nothing was missing. We were delighted to be the first guests at this brand new home stay. Amos and David (who both are teachers and speak English ) and Theo looked after our every need during our 5 day stay in September 2017. Theo’s covered fiberglass boat with 40 hp motor was a quick and safe (if the weather got rough) way of crossing between Waigeo and Batanta. Amos’s mum and sister Andi are really good cooks… some of the best meals we had during our 4 week stay in R4. Having the bathroom / toilet at the back of the bungalow was a bonus. The sheltered bay has good coral and fish life especially on the edge of the drop off and you can walk around to the next pristine bay to the east on low tide… stunningly beautiful !! … a quick trip to the Batanta waterfall and sand islands….. highly recommended.